In a bowl, mix shortening, peanut butter and honey. Add eggs; mix well. 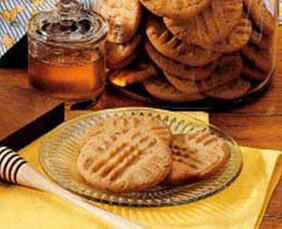 Combine flour, sugar, baking soda, baking powder and salt; add to peanut butter mixture and mix well. Roll into 1- to 1-1/2-in. balls and place on un-greased baking sheets. Flatten with a fork dipped in flour. Bake at 350° for 8-10 minutes.